Your kids won't be able to resist these just-announced games, from Overcooked 2 to Super Smash Bros. to Spider-Man, from the biggest show in gaming. The Electronic Entertainment Expo (E3) is the biggest gaming event in North America. Thousands of fans and industry professionals from around the world gather to check out not-yet-released games and revel in the world that is video games. SuperParent is at E3 this year, and we’ve seen many games that fall into the category of “good for grownups, but so not good for kids.” We’ve also zeroed in on a handful of games that can be played by the entire family. Here are nine new games that your kids won’t want to miss in the coming year. Disney fans will love this mashup of characters in a world-jumping action role-playing game that’s fun for grown-ups, and easy enough for kids to pick up and play. Mickey Mouse, Donald Duck, and Goofy join forces with new favorites like Elsa, Captain Jack Sparrow, Wreck-It-Ralph, Tangled’s Rapunzel, and more. It’s for the PlayStation 4 and Xbox One, and there’s a special PS4 version with the previous games, too. This charming game stars strange, yet adorable, yarn creatures that use their bodies to navigate bright, colorful environments. This new version of the game lets two players jump into the action together, making it a great option for the entire family. The game is available now for $19.99 on PlayStation 4, PC, and Xbox One. The frenetic cooking action is back in a follow up to one of SuperParent’s most-recommended family games, Overcooked. Work with friends to make meals for hungry guests without setting your kitchen on fire. This new version will allow you to play with someone at home and online, and there will be more wacky stages including ones that will shift and change in the middle of a level. Look for Overcooked 2 on Nintendo Switch on August 7. This game combines a truly magical environment with an irresistible combo of platform-hopping action, puzzle-solving, and storyline that centers on a white guardian spirit named Ori and a young owl. This game is set for release in 2019 for Xbox One. If your kids liked The Legend of Zelda, they’ll be thrilled to check out this new hack-and-slash adventure game starring an adorable sword-yielding fox. This game will be released exclusively on Xbox One, release date is still TBD. Spider-Man takes another heroic turn in this fantastic looking new game for the PlayStation 4. Freely explore New York City and complete missions with the ultimate goal to put Spidey’s biggest enemies -- Scorpion, Electro, Vulture, and Rhino -- (and a lesser known villain called Mr. Negative) back behind bars. And the action is punctuated by Spidey’s typical funny banter, adding levity to the intense -- but blood-free -- battles. If you can’t get your kids away from the tracks in Mario Kart, this is the game that might be able to tear their attention away for more than a minute. The longtime Sonic franchise also has a fun kart-racing game, starring Sonic the blue hedgehog and his crew. Characters from Dragon Ball Z, Naruto, Death Note, and One Piece will go head-to-head in this new crossover brawling game that fans of these popular anime series will not be able to resist. The game is set for release sometime in 2019. This battle game lets you to go head-to-head with many of your favorite characters from the Nintendo universe and beyond -- everyone from Mario and Zelda to Pac-Man, Pokemon (now with a female Pikachu and female trainer! ), and more. This game is great for kids because it’s easy to play and difficult to master. This game has legions of passionate fans -- so we’ll give you fair warning: If your kids play, there is a serious chance they’ll want to do it again and again and again until they master all of their fighting moves. Look for this game on Nintendo Switch sometime in 2019. 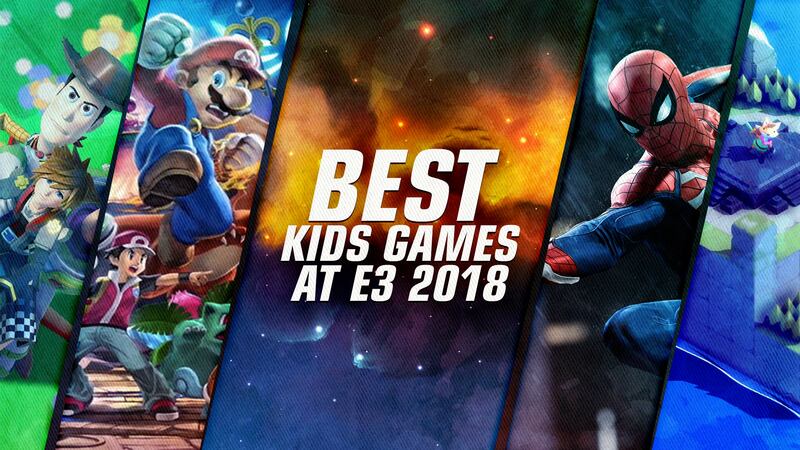 If you're looking for even more family-friendly games from E3, check out some of the games Nintendo showed off, like Super Mario Party and Fortnite on Switch.